The 6.0 and 6.4 Power Stroke engines are designed with heavy emissions controls in mind. This means that the camshafts aren't designed to take full advantage of the air flow the heads can produce. They are designed to reduce emissions by keeping some exhaust gas in the cylinders. This is one of the reasons it is so hard to spool up a non-vgt turbo on your Power Stroke. 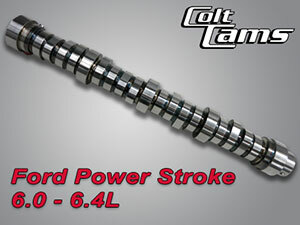 Colt Cams has worked with numerous performance shops over the years to perfect a suitable upgrade that not only performs better, but is reliable. These cams will help reduce EGT's (by getting the exhaust out of the cylinder and new air in), improve horsepower, improve the engine's performance throughout the entire rpm range (yes, you guessed it, by getting the exhaust out of the cylinder and new air in!) and can support up to 5,000 rpms. These are new and in stock! Like the Stage I, it is a great option for everyone except the most serious of competition vehicles. Stage 3 and Stage 4: Competition camshafts; need we say more? Call us today to get the lowdown on which one you need and what it will take to put you out front! Stage 1 - This is a regrind using the customer's core or exchange. No mods are required; it has a very smooth idle, quicker boost, lower egt’s, better torque and H.P. Fuel economy has also shown an improvement. This cam delivers almost everything a work truck or tow vehicle could ask for. Stage 2 – This grind is very similar to Stage1 but done on a brand new steel billet; again a straight drop in. No core required. Stage 3 and 4 - These are race cams, using a new billet, and valve relief is required. NOTE!!!!! When we say our camshaft is a straight drop in, we mean: In almost all cases. However, due to many contributing variances in an engine: heads planed, block decked, valve recession etc... any cam including stock, should always be checked for clearance before start up!